Your business is complex, but your planning process can and should be simple. This is the company that radically simplified business planning and performance management over 20 years ago. They can help you and your teams create a culture of focus, alignment and accountability without complexity. They have a wide variety of business plan solutions and their coaches and support team can help you whether you are a one person or a $1 billion company. Women’s Accelerator Program… Special Limited Time Offer for Members! Wanting to finally get that business plan written? Implemented? If you are an established business woman, the Women’s Business Accelerator will support you and your business in ways you never imagined! We combine a pragmatic and a relational approach to business plan development. You’ll create a vibrant plan, full of goal-oriented strategies and once that’s done, you’ll enjoy the brain trust of brilliant business women like yourself to help actualize your goals. No more isolation! NAWBO members are entitled to a 20% discount on One Page Planning and Performance Management Software Solutions and 10% discount on coaching and implementation fees. 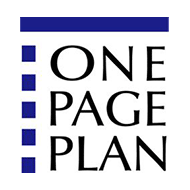 NAWBO and its members have significantly benefited from The One Page Business Plan® over the years and encourages you to learn more login and click on Affinity Partner Benefits link.